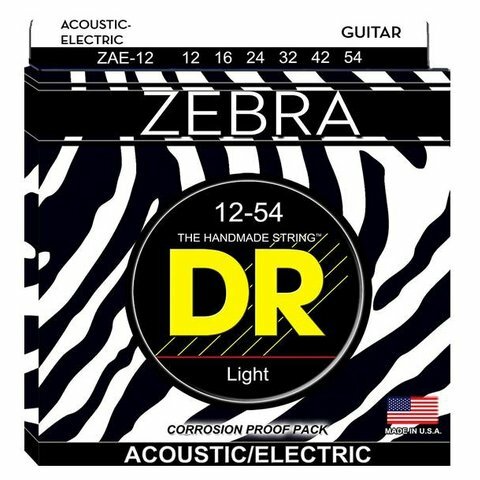 ZEBRA acoustic-electric strings wound on Round Cores! They are designed for acoustic-electric guitars with piezo pick-ups under the bridge...or magnetic pick-ups in the soundhole. ZEBRA acoustic-electric strings wound on Round Cores! They are designed for acoustic-electric guitars with piezo pick-ups under the bridge...or magnetic pick-ups in the soundhole. Full size archtop jazz guitars also respond to “Zebras” with “Richer tones” according to players. ANY amplified acoustic comes ALIVE when you put on the Zebra strings. Revolutionary because no one has ever done this before. And no one else does it yet. It is the very first string where you can SEE the difference. Every other coil is nickel-plated steel, every other coil RARE phosphor bronze.